Play Me Again Pianos Debuts Their Sixteenth Public Piano! ALPHARETTA - June 25, 2018 -- Play Me Again Pianos, a nonprofit charity dedicated to installing and permanently maintaining 88 public pianos throughout the Atlanta area, announced today its newest piano will be unveiled at the pavilion in Rock Mill Park on Sunday, July 8, at 3 p.m. Play Me Again Pianos invites the community to a ribbon-cutting ceremony for the piano named “Oscar.” The event will feature a brief performance, after which Oscar will be open for everyone to play and enjoy. "Street pianos and public pianos inspire people to connect with each other in ways that were once common, but seem increasingly rare. 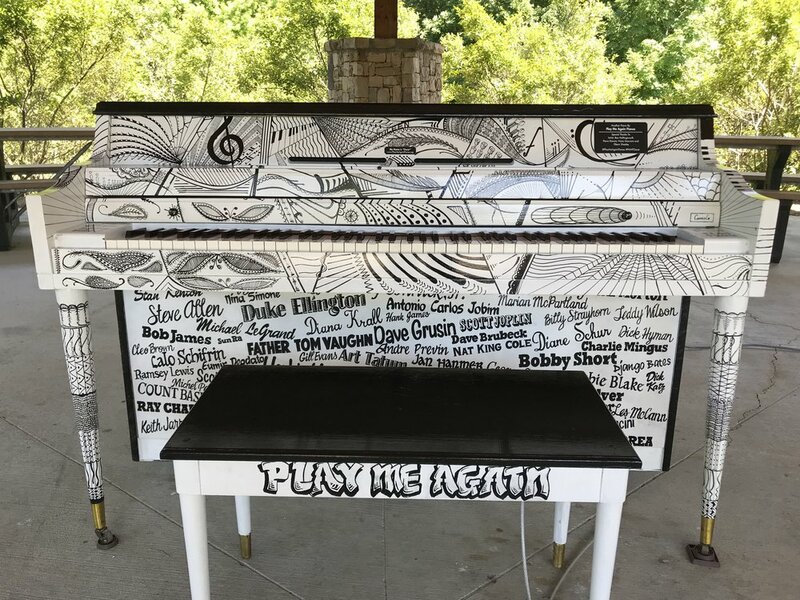 By adding our pianos to the landscape throughout the metropolitan area, we hope to nurture that connection into an evolution of Atlanta’s culture, community and the arts," said Jason Brett, co-founder of Play Me Again Pianos. The piano was named by Hollingsworth for his favorite jazz pianist, Oscar Peterson who can imitate the style of many keyboard artists. Oscar is the second public piano in Alpharetta, the first, “Flannery” is in Cogburn Road Park and was painted by Wendi Schutt with a gorgeous peacock theme. Additional Alpharetta pianos will be coming soon to Wills Park Equestrian Center and Webb Bridge Park. Find and play the other public pianos in the metro area at the Chastain Park Playground, Woodruff Arts Center, Colony Square, Dunwoody Nature Center, Chamblee Rail Trail, Ashford Park in Brookhaven, East Cobb Park, Ponce City Market, Atlantic Station, Cogburn Road Park, the Egg Harbor Cafe in East Cobb, Mount Vernon Presbyterian School in Sandy Springs and on the Grange Hall porch at Serenbe. Additional pianos are in various stages of planning and development. After a 32 year career as an art teacher, mostly with Fulton County Schools, Ben retired in 2006. He began quilting a year later. As a member of two quilt guilds and a fiber art group, he has served in leadership roles with each. Ben’s quilts have won numerous awards over the past 10 years. He is an artist whose choice of media is fabric. For the past five years he has worked with a core group of arts advocates to create ArtsAlpharetta.org and to establish an Arts Center in the old Alpharetta Library on Canton Street. Ben serves as co-president of Arts Alpharetta and was one of the founding members. Ben is actively involved in the Alpharetta & Old Milton County Historical Society. He serves on the Historic Preservation Commission for the City of Alpharetta. Ben has a sincere love for music and nature which shows in his work. Rock Mill Park is located along Big Creek Greenway at Kimball Bridge Road. The park incorporates a variety of environmentally friendly and sustainable aspects, and affords numerous opportunities for residents and visitors to learn about our natural environment. Park amenities include a green roof pavilion and an outdoor classroom. For more information, visit AwesomeAlpharetta.com. Alpharetta is home to more than 65,000 residents and sees its population swell to more than 100,000 each workday. Alpharetta is now Georgia’s 12th most populous city, boasts some of the best schools in the United States, and is known far and wide as the Technology City of the South due to the over 600 tech-focused companies that call Alpharetta home. Yet, while the community now has the trappings and success of a metropolitan city, Alpharetta remains known for its sense of community; an ideal environment for raising families, making friends, and enjoying a quality of life that is second to none. For more information visit Alpharetta.GA.US. Location: Rock Mill Park in Alpharetta. Find and play Oscar under the pavilion. If you have a story with Oscar that you'd like to share, please do so, we'd love to hear from you! We'd also enjoy seeing your pictures and videos. All content ©2016 - 2019 Play Me Again Pianos, Inc.